One of my commenters, Nick Goodspeed, had the wonderful idea of racing the tiny Tata Nano when it is released into the market. 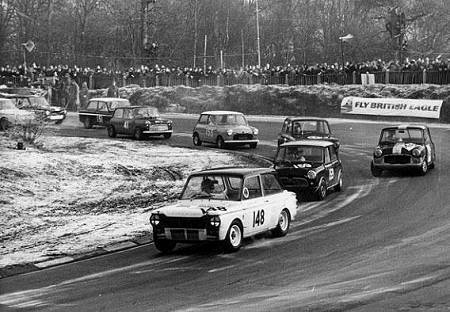 It brought back memories of the Minis that dominated saloon car racing in the early sixties and the incredible fun they were to drive. But, for me, another memory came to mind, one that was inspired by that vision of a horde of Minis jostling for a corner, a squabbling, brawling bunch of pure enjoyment. In those days there was one interloper in the crowd, a lone ranger who refused to bow to the front wheel drive revolution. And it all began in the most unlikely place of all - the Rootes Group of marques, long since extinct, including such forgotten names as Hillman, Singer, Sunbeam and Humber. There was still life in the company back then and they conceived a plan to beat BMC's wunderkind, the Mini, at its own game. The result was the Hillman Imp. Released in 1963, the Imp was the exact opposite of the design concepts of the Mini. Instead of a transverse engine driving the front wheels, it had the engine in the rear, canted over at 45º to keep a low profile. And what an engine it was! Unlike the ancient lump that powered the Mini, the Imp's engine was developed from a racing Coventry Climax motor, was built entirely of aluminum alloy with overhead cams and had the potential for extensive tweaking. The result was a car that cried out to be raced. I was approaching the legal age for driving when the Imp came out and it became the object of my desire immediately. I had learned to love rear-engined cars in my mother's Renault Dauphin and, besides, everyone wanted a Mini and I was never one to run with the crowd. After a long campaign of persuasion, my mother made the mistake of buying an Imp as her next car. It was all I had expected it to be - exhilarating in its performance and just as much fun as the Dauphin around corners. The fact that the gorgeous little engine used to go bang quite regularly was a minor inconvenience to me. In Britain, it seemed that only one driver saw the potential for racing in the Imp. He became a regular entrant, a lonely upholder of rear wheel drive tradition. This was Roger Nathan, a driver of considerable achievement in sports and saloon cars, and the Imp did not let him down; he was often the victor over those swarms of Minis. He went on to build a business around tuning and race-preparing Imps. But Roger is also my excuse for writing about Imps at all - he is the one link with F1 that excuses this post. In 1961 he had tried his hand at motor racing and liked it; he bought a Lotus Elite and an Elva Formula Junior from a well-known used car dealer. That slick salesman was Bernie Ecclestone and we all know how his silver tongue was to enable him to become Mr Formula One in a later age. So that is what Nick's comment brought back to me - the days when the Mini was the diminutive king of the race track yet was challenged by one man driving a car that bucked all the trends. In later years I did own a Mini and it is true that they were the ultimate fun car. But the Imp was just as good and what is more, it was different! I hope you don't disagree if i share some of my car-memories. There's really nothing as good as the first car you get your hands on. My first was a Saab 94 V4, and what a lovestory we had together. It took me only about 2,7 minutes to fall in love with the car. And then me and my father placed it in his garage and began working on it. It was probably not supposed to be as it became, but we ended up with a full restoration of the old one. When i drove the car to a controlstation, the engineer there asked where i had found my car. I really looked as if it came directly from the factory. And after a while came the winter, and i wanted to do some ice-racing. Then my father told me i had to get a little more horsepower. So we ended up in the garage again, tweaking the engine a bit. Well, i don't know how much we got, but probably not more than 10 bhp. But for me, 18 years of age and not yet dry behind the ears was extatic. I took the car to a nearby sea, and began racing. There had been a track plowed in the snow on the ice, and the walls was about kneedeep. But when i had been there for a while there was no more walls. And i had the most fun i have ever had with a car. I believe i finished about 2 tanks of fuel per week that winter, just sliding around on the ice. There's one thing about the Saab 96, that makes it really stand out, and that's a function called "freewheel". It is a handle under the dashboard that disables enginebraking, so that when you release the throttle the frontwheels continues to spin as if you have pushed down the clutch. Just imagine what that did on the ice! I might not have been alone in having one, those cars ar on the roads still today. That beautiful engine is almost impossible to kill. But it was me and my car, my very first car, and i loved it all the time. At least for 2 years, until i bought my Saab 900. Of course i'm talking of an SAAB 96 V4 in both ocasions. Björn: The V4 Saab was an ingenious design. I had a friend in Florida who had one that he left at my disposition when I was visiting in the early 80s. There were many clues to it being built by an aircraft maker. The thin doors and the lightness are what stand out in my memory. The freewheeling was a lovely touch. Sadly, I never had a chance to drive it on snow or ice. I had Minis for over 20 years and raced them on ice and slalomed them as well. Over the years I've become a believer in Colin Chapman's belief in the benefits of lightness in a car. 10hp. in a Saab or Mini is very noticeable where as the same boost in a big car means little if nothing to the seat of your pants. We used to have saloon car racing here as a back up series to Formula Atlantic. They were nearly as much fun to watch as the main event. In effect what made the main event so interesting was Gilles Villeneuve. He was so far ahead of the rest, I think he got bored and began racing with the clock. He was always on or past the limits of adherence, drifting around each corner for the pleasure of doing it as fast as possible despite being nearly a minute ahaead of the rest. By the way Björn, to this day I dream of owning a 3 cyl. Monte Carlo. I could never get tired of hearing stories like this. The unlikely car I miss the most is a 1984 Fiat Spider. It was light and simple, and contrary to all indications, I never had a problem with it. But I think the reason I really loved it was that it was so easy to find the limit. Driving as fast as I could on a twisty road didn't mean I had to triple the speed limit. Trying to find the limit in some of today's cars always leaves me with the thought, "If I get caught, I'm going straight to jail." marc, even modern compact and subcompact racers say that they love the zen of finding the limits of their small machines... I often feel that way about computers I've had. At the same time, I think a lot of folks forget that when you design a smaller car, you gain a kind of agility, so that if weight is managed correctly, you can keep up with or pass unskilled drivers in heavier cars. I have many fond memories of the Imp - A Sunbeam Sport model. I also have fond memories of my first 'car' - an Isetta - 3 wheels - BMW 300cc single cylinder. Red of course - 'Rosebud' - with the luxury of a sunroof. That brought back some memories. The second car I owned was an Imp which my uncle had bought new and kept for years. Unfortunately 4 months after I acquired it I ran it into the back of something more substantial and trashed it. It was a fun car to drive although in the short time I had it I had a few problems. The throttle cable broke one day when I was at college and I drove it home by jamming a couple of coins under the throttle stop through town and then stopping and adding another for the out of town bits of the journey. The car did try to decapitate me once when I tried to remove the radiator cap when it overheated. Nothing like being young and dumb and crouching behind a car and removing an agled radiator cap. It shot straight past my left ear and took about 5 minutes to find as it was pitch black and raining. Funny how with the benefit of time these things are remembered fondly. Arr....Nothing like a trip down memory lane. Cant say I can macth everybody`s `proper` motoring memories but the scareiest moment I ever had in a car ( except from driving overloaded vans, you really know what understeer is when your willing it around corners) was having the misfortune of geting a lift in a slightly `tweaked` Fiat Uno 60S, a friend later told me " You flew past us and we were doing 100 mph", to say I was scared would be an understatement, but God was it fun, and I wasn`t even driving. So on that very tenuous link to a tenuous link I bid you a Happy New Year and if it`s got wheels were race it. this is great! and hear! hear! to the small car lovers. my first car was an austin america (go ahead, laugh) a car that only a slave to lost causes could love-but it was fun! my favourite car? '71 914. the balance on that thing was awesome. one winter in an ice storm i lost it on the tollway, luckily was in the middle lane and the only person stupid enough to be on the road. it made 2 complete circle spins and when i finally got hold of it again, ended up still rolling,more or less still in the middle lane and still headed in the right direction. sheer luck but the car was the best handling $500 car money could buy. verasaki: Austin Americas weren't so bad. The best thing about them was the 1275 engine that was a straight swap into a Mini. In the 70s I bought up every rusted old America I could get my hands on! I remember a 914/6 in the local saloon races. It was awful impressive and had a lovely exhaust note. In the early 70s I had to choose between an Austin Healey 3000 and a TR4. I chose the TR4 because the Healey was such a heavy, poor handling beast. We all have great memories of driving experiences, it seems. Perhaps it is these that drew us on to the sights and sounds of F1 where we can dream on a scale somewhat larger and noisier than our personal exploits. But nothing can substitute for the actual experience of handling a car at speed, taking it to the limit and, sometimes, over it! You guys are triggering memories again. The only time I was ever scared in a car was trying to make a Renault 5 turn into a roundabout at 30mph. Never seen understeer like it. Despite having hit a cow at 80 ish mph as a passenger and several high speed spins in various Formula Fords the only thing that ever had me genuinely scared was near terminal understeer in that little Renault. I can also match the harmless spin story and probably claim the slowest spin of all time. It was between Xmas and New Year and someone put on a motorsports show in Livingstone between Glasgow and Edinburgh. When I arrived it was bright sunshine and not a cloud in th sky but very cold. When I came out two hours later there was three or four inches of snow on the road. I had a FIAT X1/9 at the time and heading towards Glasgow on the M8 I could only see one other car running about half a mile ahead of me other than that the road was deserted. He started to spin and I got off the throttle and slowed even more than my previous pedestrian pace. He recoverd the spin easily and took off again. By the time I reached the point where he spun I was doing less than 20mph when I hit a slight bump and round I went. It is the only time I ever spun anything and was able to think about what to do with the steering and other controls. I did a 360, managed to make it bite and drove on like nothing happened. I spun the rear-engined cars of my early motoring days many times but the only occasion in which I really scared myself was just a few years ago, decades after my last spin. Perhaps the greater awareness of consequences that comes with age was what gave me such a fright on this occasion. It was a Citroen ZX that was my pride and joy and also the cause of my undoing. I don't know if you've ever driven a ZX, Steven, but I assure you they handle incredibly well, absolutely neutral and just going where you point them. This gave me tremendous confidence in the car's ability and I admit I tended to drive it pretty quickly as a result. It was coming off a roundabout on to a straight stretch that caught me out. I knew that section really well and hammered through at my usual breakneck speed - only to have the car snap instantaneously into massive oversteer, the back coming round like a pendulum. Loads of opposite lock applied instinctively caught the tail but, of course, it was over-correction and the car promptly whipped round to career sideways the other way. Many over-corrections later and I had it under control but I have never had such a scare before or since - it was so unexpected. The problem was oil on the road - totally invisible in the damp conditions. The sure-footed ZX went from perfect control to absolutely no grip completely without warning and I am convinced that it was only those years of rear-engined tomfoolery that saved me (and my son, who was a passenger at the time and looked somewhat ashen-faced afterwards). After reading all this, i just have to tell about a quite tenuous scare i had. This time ai was driving that SAAB 900 i told you about in my previous reply. I was coming up on a car that drove slower than me, but how much slower i never noticed really, caught up in the music i played on the stereo. So when i was about 30 meters behind him, i had to break quite hard, but there was never to be any harm done had all went as it should. But this time there was something wrong with the brakes on the right frontwheel of the car, wich resulted in the car instantly taking a jump and faced almost straight to the side of the road and the 2 meters deep ditch there really looked scary. Some how i managed to got the car to change direction again, but as you did Clive, i probably got caught up in the moment and overreacted. This resulted in the car doing a 180, facing the other side of the road. That ditch not looking as scary, but not really looking forward to end in that ditch either, i tried to straighten up the situation. When finally the car was going in the right direction again, i was on the wrong side of the road face to face with another car. I managed to steer over to the right side of the road again, avoiding any colition or any other damages more than my own nerves. After a ride like that, i just had to stop the car and get out to get some fresh air and to let my heart slow down a bit. What fun they were. I remember watching my mate Carl cornering hard and the inside front wheel was way off the ground, pawing the air like a Pointer. I remember adjusting the tappets on one too. The engine used 'shim' tappets of different widths, rather than adjustable tappets, and as I remember it we had to take the engine out to change the tappets - which involved removing the rear bumper, body panel and constructing a supporting block for the engine and rolling the rest of the car forward . . . I'm sure that was the longest way round a relatively simple task, but we were eighteen and eager to learn! Thinking about racing Imps, type Bill McGovern Imp into Google Images and look at some of the lowest, rapidest, daftest Imps ever built. Thanks, Nick - some great photos there. I knew that I was exaggerating slightly to give Roger Nathan all the credit for racing Imps but he was the first and was involved in their development longer than anyone. Bill McGovern was certainly another to prove how fit for racing they were and he showed what fun to drive a small, rear-engined car could be! Talking of the problems inherent in working on Imp engines, I never had that dubious pleasure but heard many a tale of what pigs they were to work on. Nick, I remember tappets job. As you say a relatively simple task - once the engine was out ! I recall going to a breakers yard and getting a sack of shims before starting. I seem to recall making a support block that I used on a trolley jack - precarious but it worked. One of the awkward jobs, was those rubber drive shaft donuts. You had to use jumbo jubilee clips to compress them or the bolts in the 'spider, wouldn't align ! Like you I was young and keen - and the whole exercise taught me a lot. On a technical note - I think that because the cam pressed directly onto the cups (poppets), there are no 'tappets' as such. Maybe someone can clarify this terminoligy ?